There are many ways to get involved with Lucky Paws. 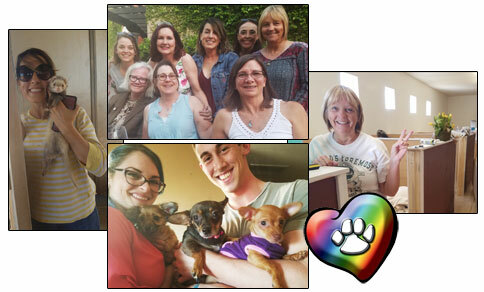 Volunteers who have already gone through orientation classes are scheduled at our many events as animal caretakers. We invite you to join us at different venues monthly for yappy hours, estate sales, holiday parties, golf tournaments, or our once a year gala event, The Fur Ball Luncheon. Volunteers are an integral part of events and fundraising. Existing volunteers are key at most of our events. If you would like to join our fundraising group send us a message! We typically meet monthly in the summer time. If you have items to donate to one of our events, let us know! If you are looking for more hands-on work with the animals, we occasionally have openings! Please know that working with the animals whilst rewarding, can be messy! We will update this page once we have an opening, so keep an eye out! Lucky Paws is also always seeking grant writers, event planners and handymen/women. Because you can make a difference in the lives of animals! 1. Be part of the solution. You’ll join a network of hundreds of thousands of people working to make the world safe and more humane for all living creatures. You’ll make the jobs of everyone working for animals a little easier by lending a hand and spreading the message of responsible pet ownership and animal protection. 2. Get warm fuzzies. You’ll never find a more grateful and accepting comrade than an animal you’ve comforted. 3. Keep good company. You’ll make lots of new friends—and not just the four-legged kind. Working side by side with people who share similar interests can forge lifelong friendships. 4. Meet the new you. You’ll discover skills you never knew you had, and you may be surprised at what you’re capable of achieving. 5. Gain a new career. You’ll learn things that may lead you to the career—or career change—of your dreams. Employers and college admissions officers look favorably on time spent in volunteer service. 6. Enjoy a wagging tail, a purr, and a smile. Didn’t someone once say that the best things in life are free?